What a Beautiful Wreck...: "Don't let anybody tell you, YOU CAN'T, just because they can't..."
"Don't let anybody tell you, YOU CAN'T, just because they can't..."
Did you take a good look at that? I did. I have spent a good portion of my Shape-Up journey defending what I'm doing, or justifying it, or trying to rationalize it... or explain it in a way that would make other people okay with it. Simple thing, that I'm slowly learning is, you can't. Anyone that is not supportive of you, when you're doing something good for you and awesome, is dealing with their own demons; either they're jealous of how good you look, or frustrated because they can't get motivated, or any number of things. But don't listen. 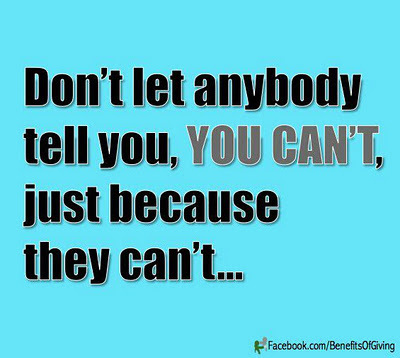 You CAN do whatever you want to do, whether or not other people believe it. ANYWAY. On to a lighter subject, BlogLand. So, originally, today was a Run Day. As I sat at work and watched the snow fall steadily, I thought, well, no problem... it's just snow. I can run in snow! I was mentally prepared to run in snow. And then the day got ickier.... It went to sleet and freezing rain and some other yucky precipitation.... and, yeah, running went out the window. As much as I *wanted* to run, I had to be smart here....... I could dress warm, but the sidewalks were pretty slick, and my knee was already (is still) angry from whatever I did to it. It's not like incapacitatingly angry, but just annoyingly angry.... just enough to make me think that an angry knee + slippery sidewalks was probably not the best plan. It seems like that's going to be an 'easy' wod, doesn't it? Admittedly, it's not grueling, but that is more reps than you would think... 55 per exercise. Again, not a ton, in the scheme of things, but better than no run or activity at all.... particularly with this stupid knee. GRR. Dear 18 year old self - when you get injured and the doctor says "stay off it"... STAY OFF IT. Let it heal correctly. Grr. So, I'm happy to say, I busted out the burpees pretty solidly (I'll be a Spartan yet! ), the pull ups I gave my best effort with the aid of a stool, and I completely owned sit ups. OH, and another small victory for today.... I got on the scale.... *drumroll*.... DOWN another couple of pounds. Officially at 207.2 as of this evening. Yes, that's a lot, but that is now closer to my goal, than to my original weight. More than halfway!! I will also be doing something awesome to celebrate when I get into "Onederland" (as Weight Watchers calls it). I'm so excited. As an adult, I have no idea what I look like at that weight. EEeee! !